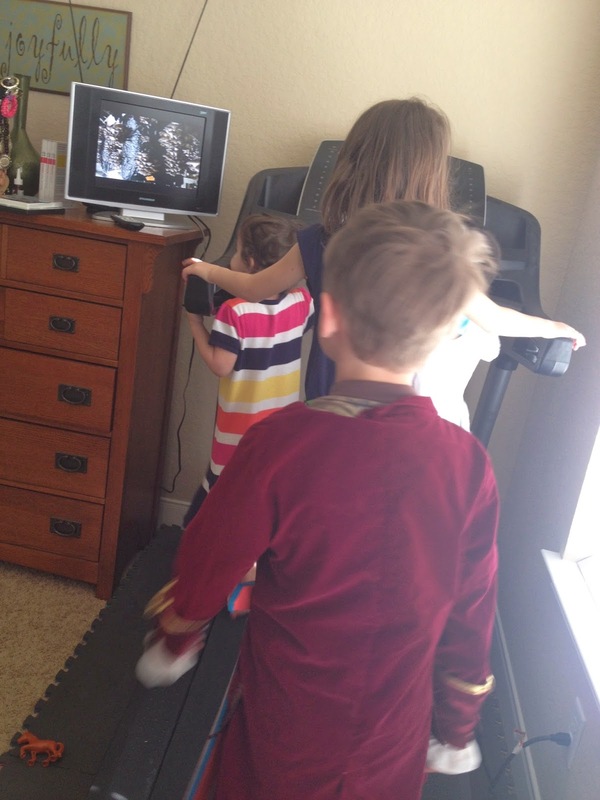 My kids love watching educational DVD’s while they walk on the treadmill – true story!!! I like that they can exercise while they learn. It’s a win-win for us! We were excited to review some new educational DVD’s from Curiosity Quest. We reviewed the DVD Combo Pack – Produce and DVD Combo Pack – Swimmers of the Sea. Curiosity Quest is a family friendly educational program that bases its content on the letters sent from viewers who are curious about something – such as “Where do oranges grow?” The producers then create a show that is shot on location to answer the question and provide educational facts about that topic. Each show is hosted by Joel Greene who is on location to give a tour of each farm, factory, or place of business. He asks questions and presents facts to the viewer. There are also interviews with children interspersed throughout the show. Kids are asked questions about the topic and they give their best guess as to the answer. Then the host answers the questions in the next portion of the show. These DVD combo packs take you on a behind-the-scenes tour of a mushroom farm, an orange orchard, and a cranberry grower. The second set of DVD’s contains a tour of a sea turtle hospital, an aquarium that houses penguins, and Alaskan rivers teaming with salmon. Each episode lasts for about 30 minutes and the program is geared for ages 7-14. We watched the DVD’s while the kids “exercised” on the treadmill. We watched them while we folded laundry. We watched them while we snuggled on the couch with snacks. We watched them while I cooked dinner. We watched them for family night. And we enjoyed every minute! And after we watched them, the kids insisted that they must eat oranges and dried cranberries – right then. They also created their own animal hospital upstairs and doctored sea creatures for several hours. We also talked about the DVD’s, read more about the foods and animals in the videos, and did some internet research to learn more. These videos started some fun interest in the topics, and we followed several rabbit trails about foods and sea animals. And we learned so many wonderful things! Did you know that sea turtles can live to be over 100 years old? They are also very fast swimmers and can move through the water at over 30 miles per hour! Did you know that cranberries don’t grow in water but the cranberry fields are flooded during harvest time to make harvesting easier? Cranberries float so they are easy to harvest on the surface of the water. Did you know that oranges were not native to America and that Columbus brought the first orange seeds to our country in 1493? Well, now you do and we do too! We learned these facts and many more after watching (and re-watching) the DVD’s. My kids loved watching these DVD’s and I enjoyed watching with them. We found the information to be interesting and the tours of the different places like an orange grove or a sea turtle hospital to be fascinating. It was like having our own private field trip! Throughout the video there are several interviews with children. The host asks them a question and films multiple children giving their answer. My kids thought some of their responses were hilarious and hilariously wrong! The interviews sent them into giggles as they listened to some pretty strange speculations from other kids. We enjoyed the host and his silly antics. He does a great job explaining the process and the facts in each video and my kids were able to understand the information well. They found him funny and his presentation to be entertaining. I thought these DVD’s were a very fun and informative look into topics that my kids (and I) found interesting. There was a lot of info packed into each show and we loved all the facts we learned. But the behind-the-scenes tours were so wonderful that was our favorite aspect of the DVD’s. These were perfect educational entertainment for family movie nights! So, what are you curious about? Check out the episodes of Curiosity Quest and you might find the answers to satisfy that curiosity! The DVD Combo Packs each retail for $24.95. You can find more about Curiosity Quest on Facebook, Twitter, or YouTube. All of them on the treadmill together! I need to follow their example when watching videos. Isn't that fun? They love to walk together and watch things. Great exercise when it's raining or too hot to go outside.